Every society has its secrets – foods, customs, words, etc. that might be seen as taboo in other parts of the world. Hush-hush is just such a secret in The Bahamas. You’ll find the term used in various parts of the islands, though not extensively…the better to keep the secret. What is it? Well, it’s actually a few different things. Basically, as I learned while limin with some locals on a recent trip to Grand Bahama, the term hush-hush is used to denote most anything and everything that’s illegal to eat. In Grand Bahama, for instance, hush-hush means turtle meat, a long-ago traditional delicacy here just as it still is in the Cayman Islands. Looking for a taste of lobster out of season? Ask for hush-hush. It’s in Inagua, though, where the hush-hush gets really exotic. Here, I’m told, in the southernmost district of The Bahamas, a plate of hush-hush would feature the pretty pink guy pictured above. Fiercely protected and absolutely illegal to harm in any way, the national bird of The Bahamas had previously been hunted to near-extinction, with only about 5,000 flamingos judged to still be around in the 1950’s. Dedicated conservation efforts, particularly those centered on the expansive bird sanctuary located in the heart of Great Inagua, have worked to restore the flamingo population. Today, it’s estimated that a good 80,000+ live in Great Inagua alone! 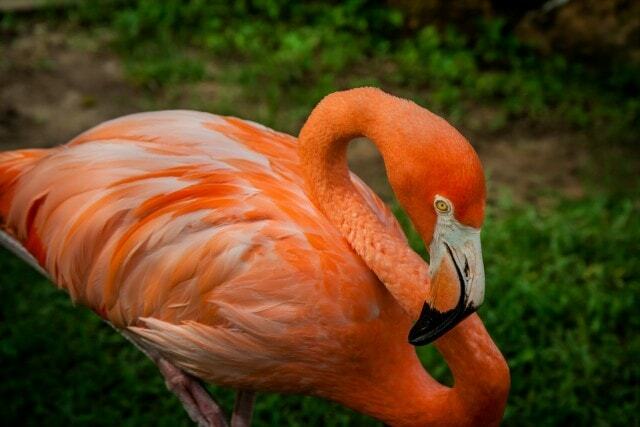 Here’s hoping that flamingos continue their comeback in The Bahamas…despite a lil’ hush-hush. *Lead photo credit: Flickr user alexmerwin13. You’re reading Hush-Hush, The Forbidden Flavors of The Bahamas from Uncommon Caribbean – The Insider’s Caribbean Travel Blog. If you’ve enjoyed this post, be sure to follow Uncommon Caribbean on Facebook, Twitter, and Google+. There are more than 700 islands in the Bahamas, many of which have escaped the notice of tourists. The islands offer clear warm water and sandy beaches. Several are relatively large but others are tiny and uninhabited. All the larger islands offer a high standard of accommodation and leisure facilities. With soft breezes, sunny beaches and a warm welcome for families, as well as Spring Break revelers… Bahamas is a major port of call for fun in the sun. Beaches are of two types in Bahamas: the activity beach and the deserted beach. On an activity beach, of which Cable Beach in Nassau is the prime Bahamas tourist attractions, you will find tons of things to do, and every service will be at your fingertips. Water skiing, windsurfing, diving, fishing, sailing, parasailing, seaside restaurants, beach bars, and local entertainment are all here. On the other hand, you will not find any of that on the deserted beaches, but then, that is the whole idea. About 80 percent of the beaches of Bahamas, if not more, are isolated: meandering ranges of virgin sand, warm under your bare feet. There will be no motorboats or crowds, so you can enjoy the subtlest nuance of the surf’s music in peace. These beaches attracts tourist who come here to enjoy the natural beauty. Other than beaches there are many National Parks that are major Bahamas tourist attractions .One of the most famous attractions is Exuma Cays Land. Exuma Cays Land and Sea National Park was created in 1959.This National Park covers112640ac/45,603ha of land and sea in and around the Exuma Cays. The park is referred to as a submarine Garden of Eden and the numerous islets and cays feature unspoiled beaches, attractive anchorages as well as colorful marine life. Some caves are still home to iguanas, and many species of colorful tropical birds can be sighted. The marine park is noted as the first of its kind in the Caribbean. Another famous National Park is Inagua National Park. Inagua National Park is in the center of Great Inagua and covers 183,740ac/74,389ha of land surrounding Windsor Lake. The park is famous as the largest nesting ground for West Indian flamingos, with flocks numbering up to 55,000. Other birds such as spoonbills, herons, Bahamian parrot and hummingbirds can be seen in the park as well. The landscape features karstic caves that are home to various species of tropical bats, and turtles roam the shores of the various lakes throughout the park. Atlantis Hotel Aquarium is a must see for marine lovers It is another most important Bahamas tourist attractions. Billing itself as the largest open air aquarium in the world, this place concentrates on a collection of Caribbean species. One watches stingrays and schools of shining fish swim among the fanciful artifacts of the lost city of Atlantis. While some of the tanks are used as a backdrop for the lobby and restaurants, these free peeks are only a small fraction of what is to be seen. It isn’t only adults and couples that may go to the Bahamas households can go too; in fact, although it is fairly shocking to many, more families go to the Bahamas regularly than every other group, and for incredibly good reason. There’s a lot enjoyable in a position to be had within the Bahamas, and so many resorts that cater particularly to the families. In case you are planning a Bahamas family trip, there are several key things that you will want to take into consideration throughout the starting stage of your trip. As an illustration, in case you are planning on occurring a Bahamas household vacation, you will want to find a resort or resort that caters to families, in order that the youngsters will not be bored and so that you’re your partner will still have some enjoyable activities to do as well. It is important to know that though the data available with reference to a Bahamas household vacation is actually extraordinary, it shouldn’t be frustrating to search out exactly what you’re looking for. As an illustration, using the Web as a resource tool on your planning of a Bahamas family trip is a great concept, because the velocity and effectivity of the Web will permit you to slim your search dramatically. The Atlantis Resort, for example, is a superb place for families, as a result of they provide extra family based mostly actions than the rest, and thus can be a fantastic place for your family to stay on the trip. They have waterslides, waterfalls, lagoons, dolphins, and rather more, in addition to a variety of activities for adults, so that you just and your partner can also spend some alone time together if the youngsters are old enough to be left alone for a night or two. Do not forget that the most important factor is that you simply and your family have as much enjoyable as potential, and so try to plan forward as a lot as you possibly can, so to spend each second having enjoyable and having fun with your self if you are there, slightly than being misplaced and confused and not sure of what to do next. There are such a lot of resources which might be available to help in this precise regards, and so you must also take as much benefit of those as you presumably can. By doing this, you’ll make sure that you and your loved ones could have a fully great time. If you need other knowledge regarding how to lose stomach fat stop by the writer’s website soon. Remember the scene in the film, The Beach, when Richard arrives on a remote Thai beach and learns the art of spear-fishing? Swap the Thai beach for the tropical waters of the Caribbean and you have your own natural paradise. However, unlike Leonardo Di Caprio’s character you won’t have to fashion your own spear out of bamboo, as the only weapon allowed in the Bahamas’ fishing version is the Hawaiian sling, designed to act in the same way as an underwater slingshot. While this sling technique isn’t as up to date as the sling gun – the more commonly used method for spear fishing – Bahamas’ officials have banned such methods to preserve the volume of fish currently living in the waters. You need to be more than just a hunting aficionado in order to really excel in the Bahamas fishing for your prey. Some of the best spear fishermen are masters at free-diving, an extreme sport where competitors reach record depths and distances on a single breath. Taking a Hawaiian slingshot with you and attempting to catch prey while free diving really adds an element of thrill to the mix. However, if you haven’t practised free diving before then it’s probably not a good idea to do so with a slingshot in your hand. It is still easy to enjoy spear fishing while diving normally or even when snorkelling. The time of the year can really make a difference to, not just the visibility of the water, but the prey that you are fishing. Bahamas’ tropical islands might be the perfect destination on a year round basis, but the months of May, June and July have the best visibility and the warmest waters. If it’s bonefish that you’re after then the cooler waters of November through to February are when wahoo and bonefish are abundant. When in The Bahamas fishing with just a spear you’ll need to wear a specialist wetsuit. Some of these wetsuits come in two pieces and often include an optional hood and shorts. You’ll also need to wear fins, gloves and a mask. Many professional spear fishers use water belts to aid a faster descent, as well as wearing special fins which are slightly longer than your average scuba diving fins. Of course, before you get good enough to start spear fishing professionally you’ll need to learn with an experienced guide. There are numerous companies in The Bahamas that can take you out, although you’ll be required to watch some vital safety information and undergo training before you try it for yourself! Omar Isaacs is the Marketing Executive for The Bahamas Tourist Board, a tourist organisation that can help you discover the perfect Bahamas fishing holiday, and assist you to select and book the right type of Bahamas fishing holiday for you.